It is more effective when the body is "stacked" and aligned against the forces of the turn, using the skeleton more than the muscles to support the weight/pressure. You can get away with this at small angles and bunny slopes, but when the going gets tough, this will get you in trouble. It's also not good for short/slalom turns, where it introduces too much Rotation. As you can see above, at high angles and powerful turns, we need to "stack" against the outside ski, where the inside ski is even lifted. Having the body between the skis does nothing useful: we need to be balanced and stacked over the outside ski and that requires angulation and coiling - this is where Separation and coiling help align most of the joints on top of the outside boot. 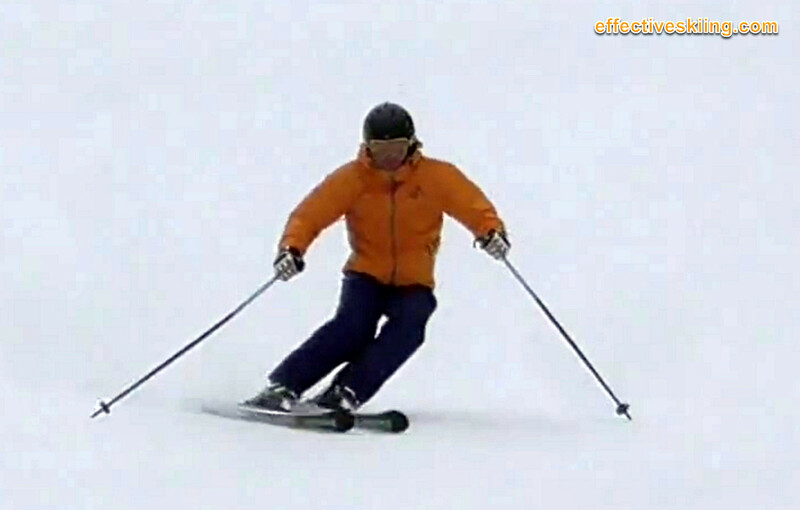 Lacking the ability to balance over the outside ski, which is quite common among skiers, is what leads to an inability to control speed in carved turns: one simply cannot bend the ski sufficiently or continue the turn sufficiently to control the speed, if one cannot balance over the outside ski! Stacked "square" is a similar issue as using a wide stance. It will perhaps feel more "stable" at low speeds and relaxed skiing, when weighting both skis, but will become a hindrance when we actually weight just one ski, which is what we want even on the green slopes. When we are committed to the outside ski, if the inside ski is far apart, it will just make it harder to edge the skis and balance. Viewed 1413 times ( | Print ) this page.